A builder who wanted to expand a South End brownstone made a gift to the adjacent St. John the Baptist Hellenic Orthodox Church. The proposition reads like a payoff. “We would like to offer your nonprofit $10,000 a year for 20 years for your support at the ZBA next Tuesday,” an advertising firm proposed to a West End neighborhood group earlier this year, in an e-mail obtained by the Globe. In South Boston, two civic associations in July negotiated with a developer over the cost of their support. They wanted $5,000 each, but settled for $2,500 . And in the South End, a church abruptly withdrew its letter of opposition to a residential project shortly before receiving $50,000 from the developer. In Boston, where the Zoning Board of Appeal often gives great weight to neighborhood sentiment, community support has become a crucial commodity that can sometimes be bought almost as easily as lumber or drywall, according to an extensive Globe review of city records, e-mails, and court documents. The system was laid bare in a Suffolk Superior courtroom this summer in a defamation lawsuit. At the trial, real estate agent Joyce Lebedew alleged that Brian R. Mahoney, longtime leader of an influential civic association, strong-arms developers for money. Mahoney, an officer of the St. Vincent Lower End Neighborhood Association, strongly denied taking cash from developers and told the Globe that “not one iota of evidence” presented in court supports the allegation. But Mahoney, who wields significant influence over projects in Boston’s hottest real estate market, acknowledged soliciting donations from developers who have come to his civic group looking for support — money for a playground, ball field, youth sports, and two charities not registered with the state that list their address as his home. The pressure for developers to pay is a byproduct of Boston’s tortuous zoning rules, under which almost nothing can be built without a vote from the Zoning Board of Appeal. The seven-member board rules on projects that do not comply with existing zoning — which is largely restrictive by design, so that City Hall has the final say and neighbors and others can have input. Large projects, with more than 15 units or 20,000 square feet, must also be approved by the board of the Boston Redevelopment Authority. As part of the review process, city officials direct developers to present their plans to neighborhood associations, and the ZBA frequently cites the opinions of civic groups in deciding whether a project gets its permits or dies on the drawing board. The exchange of money in the process, often without disclosure to Zoning Board members, raises questions about the motivations of neighbors and the impartiality of some of the local groups City Hall relies on as barometers of neighborhood sentiment. Winick said he gives checks not cash and has not seen evidence of civic leaders enriching themselves personally. The Walsh administration has looked to expand the community review process for development beyond civic groups. Mayor Martin J. Walsh has increased the emphasis on meetings with abutters, and the administration is studying other approaches, such as establishing online town halls for residents who cannot spare a night away from home or work for a public meeting. One blunt-edged negotiation over price played out over e-mail in July about a project due to come before the BRA. Gary Murad is president of the St. Vincent Lower End Neighborhood Association, which advocates for the interests of a swath of South Boston north of West Broadway. Murad wrote to City Hall to announce a deal with developer Joseph Hassell, who had proposed a five-story residential building at 55 W. Fifth St., according to an e-mail exchange acquired by the Globe in a public records request. Murad, who included Hassell on the e-mail, said, “we agreed, in recognition of our support” to a $25,000 payment from the developer, of which $15,000 would go to a local park and $5,000 each to the St. Vincent organization and the Cityside Neighborhood Association. Less than an hour later, Hassell objected, writing that he had never agreed to a $25,000 payment. He was thinking of something more like $13,000. “Also just so you are aware several people have huge issues with the civic associations collecting money from developers and have expressed concern,” Hassell wrote to Murad and city officials, not identifying who was concerned. Murad shot back: “I welcome hearing who has issues with our 501c4 receiving money,” a reference to the civic organization’s nonprofit tax status. Two days later, Murad shared a new deal with the Boston Redevelopment Authority: a $15,000 payment from Hassell, with the civic associations getting $2,500 each. The BRA blessed the payments and included them in its agreement with the developer. Hassell, reached by telephone, hung up immediately when a Globe reporter identified himself. Noreen Rosher, head of the Cityside organization, did not respond to a message seeking comment. In an interview, Murad said it was the first time he had negotiated a direct payment from a developer to the neighborhood association, an assertion confirmed when St. Vincent made its financial books available to the Globe. The ledger showed a shoestring organization subsisting on $10 annual membership dues that spent its scant resources to buy flowers and trash bags for a spring cleanup. Murad, Mahoney, and other leaders are unpaid volunteers. The idea to solicit direct donations from developers came from another civic association, which Murad declined to identify. Michael Christopher, deputy director of development review for the Boston Redevelopment Authority, said, “It is not uncommon for a civic association to receive funds from a developer.” The financial agreements are delineated in public documents approved by the BRA board, Christopher said, ensuring deals for large projects are at least transparent. But in a city awash in billions of dollars in development, money can influence support for smaller projects that don’t get BRA scrutiny. And unless city officials are notified of secret side deals, they have no way to know whether money has changed hands or how to judge the motivations of neighbors and community groups weighing in on development projects. 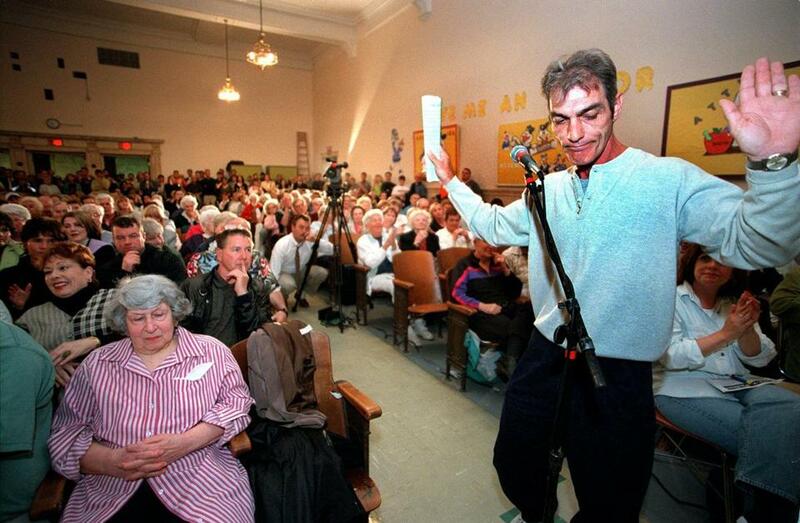 Brian R. Mahoney, shown at a South Boston community meeting in 2000, says he has sought support from developers for his civic group, the St. Vincent Lower End Neighborhood Association, but he denies ever receiving cash payments. Stephen Fox, chairman of the South End Forum, an umbrella group that includes 17 civic and business associations in the South End, said that while there have been occasional rumors about money or perks for abutters, he has never — in his 25 years of neighborhood activism — heard of a developer cutting checks directly to civic associations. In South Boston, Mahoney raises money from developers while also moderating the St. Vincent association’s public meetings, at which developers present their building plans for the neighborhood’s review. “There is no quid pro quo,” Mahoney said, though he acknowledged in an interview there could be a downside for developers who refuse to donate. “Well, I suppose on a future project there may be some type of consequence,” Mahoney said, laying out a hypothetical in which a developer gets neighborhood support for variances, but then declines to donate to local causes. A South Boston native, Mahoney served in the Army in the late 1960s and earned the Korean Defense Service Medal, according to Army records. He joined the Boston Police Department in 1983 but was fired in 1991 for conduct unbecoming an officer. He has since worked as a sexton and janitor at St. Vincent de Paul Parish and written for local newspapers, including South Boston Today, a weekly at which he is editor in chief. In 2013, Southie builder Gregg Donovan filed suit against Mahoney and two other defendants from South Boston Today: publisher John Ciccone and managing editor Brian P. Wallace, a former state representative. The suit accused the paper of publishing falsehoods about Donovan’s business, such as a claim in a Mahoney column that Donovan was working on a development project without permits. Donovan won $162,500 in damages when the defamation case came to trial this past July. Mahoney said the defendants are filing an appeal. A subtext of the trial was the allegation that South Boston Today was used as a weapon to foment neighborhood opposition and Mahoney’s articles were intended to pressure Donovan to pay tribute to Mahoney, which he said he never did. Mahoney rejected that accusation. “The conversation as she related didn’t happen that way,” he testified. Lebedew did not respond to phone and e-mail messages from the Globe. Mahoney said the checks he collects are made out not to him, but to the various local causes for which he raises money. He said he had sole control over two association bank accounts with combined balances of $150,000. “I ask people, ah, developers, for donations for specific issues,” he testified. The Globe found apparent inconsistencies in some of Mahoney’s testimony. He said a representative from Cedarwood Development came to his house with a $1,000 check for the most recent St. Patrick’s Day parade. Parade organizers say they have no record of the donation. The developer, David C. Matteo, told the Globe he did not recall making the donation but was not certain. In an interview, Mahoney said the money could have been for another of his fund-raising efforts, Veterans Express II, a program that takes veterans on trips to Washington. The organization, which lists its address as Mahoney’s South Boston home, is not registered with the state and opened its own charitable bank account only after inquiries from the Globe. Mahoney provided the Globe a year of bank records that showed a high balance of $57,000 and nearly 100 checks from donors that included at least $34,400 from developers and other businesses that look to civic associations for support. The records offered only a few details about expenses. Another organization headquartered at Mahoney’s home is “Friends of Evans Field,” which is not a state registered charity. Records show Mahoney in 2006 donated $10,000 for upkeep of the South Boston ball field, though under oath he testified he gave $13,000. South Boston Little League officials said two developers have made donations at Mahoney’s behest in recent memory. Another developer, Doug George, recalled meeting with Mahoney and Murad to discuss a project on West Broadway. “Any suggestion they might have been looking for a favor or money is far from the truth,” said George, who has agreed to donate $10,000 to the city’s Fund for Parks to support a nearby playground. In the city’s South End, a major addition to a brownstone elicited a letter of opposition from a neighbor, St. John the Baptist Hellenic Orthodox Church . The letter briefly became an issue at a ZBA hearing in November 2014, until a representative from Walsh’s office announced that the developer had “done a lot of work with the church to get everybody on board” and St. John’s had just withdrawn its opposition. 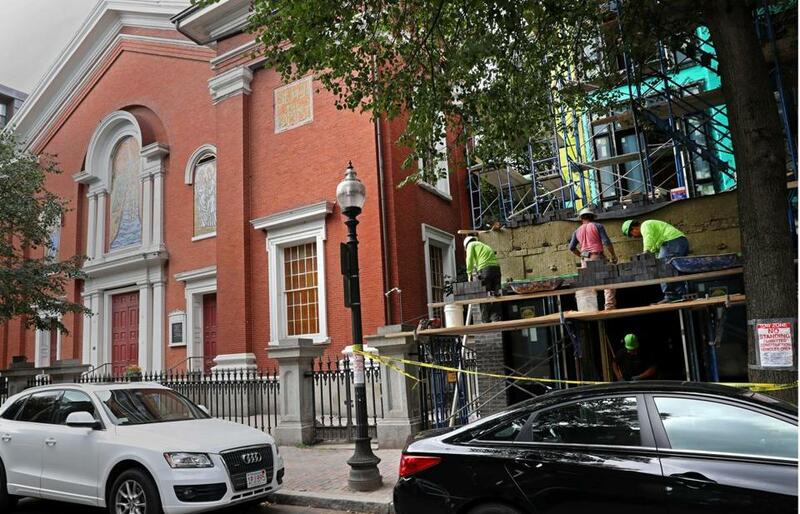 The developer, Thomas Calus, confirmed to the Globe that he donated $50,000 to the church to help fix the roof and make other repairs. The donation, Calus said, was not a condition of St John’s dropping its opposition. The church did not respond to a phone message seeking comment. Another example could be found this past spring in the city’s West End, where outdoor advertising company Media Vision of Winthrop went hunting for support for its proposal for a digital billboard at 55-59 Causeway, which was heading to votes before city boards. In April, Media Vision lawyer Sean T. O’Donovan pitched the project to the West End Civic Association . He wrote that Media Vision cares about the city, “and as such, when the time is right want to pledge $5,000-$10,000 a year” toward a pedestrian path in the neighborhood “or to some other community benefit as your group sees fit,” according to city e-mails. The civic association eventually came to oppose the project over concerns that billboards could proliferate and clutter the neighborhood. Serra personally e-mailed a second group, the West End Community Center, with an offer of $200,000 over 20 years in exchange for support at the ZBA, according to a copy of the e-mail. The center did not take the offer because the group did not want to get involved in politics, according to one of the nonprofit’s officers. In an interview, Hanson said the arrangement was no different than signing a sponsor. The billboard lost a ZBA vote after facing opposition from the mayor’s office, and the project died in June along with the pledge of financial support for the museum. Ken Smith, president of the Old Dover Neighborhood Association in the South End, said the associations bring expertise to the development review process. It’s a perspective developer Bruce Daniel said he appreciates. Daniel, who has done work in South Boston, recalled that Mahoney hit him up for money toward fixing the roof at St. Vincent de Paul Parish, perhaps 10 years ago. Mark Arsenault can be reached at mark.arsenault@globe.com. Follow him on Twitter @BostonGlobeMark. Andrew Ryan can be reached atandrew.ryan@@globe.com. Follow him on Twitter @GlobeAndrewRyan.